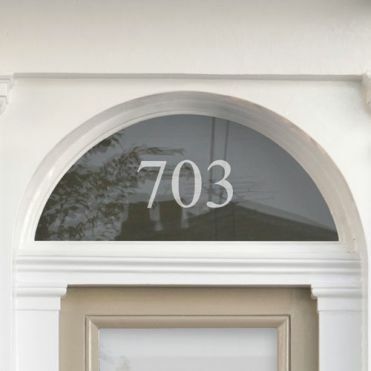 Design your own fanlight house number or house name sticker to your exact measurements, and in a choice of fonts and colours. This option will enable you to have a coloured or etch effect text within a clear background. All text will be centered before cutting/printing. This is only a graphic representation. I confirm that the measurements I entered are in centimetres and correct for width and height. This design is for internal application on glass and as such will be supplied in reverse, for the text to be read correctly from the outside. Use the "additional requirement" box to stipulate otherwise. You must approve the preview before continuing. Your design will be shown in the preview box. Make the necessary amendments until you are satisfied with your design. 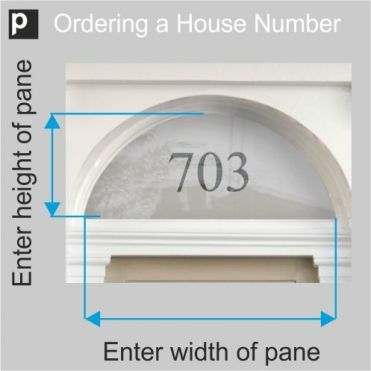 To order please enter the measurements of the pane you wish to cover in CENTIMETRES. If you want to leave a clear gap around the film, just deduct the size of the required gap twice from the width and height of the window (eg if your window is 30cm x 40cm and you require a 1cm gap all round then order the film at 28cm x 38cm). Window film is applied internally on glass, so your design will be printed in reverse to be read correctly from the outside. If you have to apply the film externally, please let us know in the extra requirements field and we'll make sure your design is not printed in reverse. We print coloured text on a clear film so your whole pane will be covered and your number perfectly centered. Just enter your house number or name in the text box and it will show in the preview. Select a font of your choice and play around with the size (in centimetres) until you are satisfied with your design. The finished product is easy to apply using soapy water and a felt edge squeegee provided with your order. We also supply other handy installation tools.